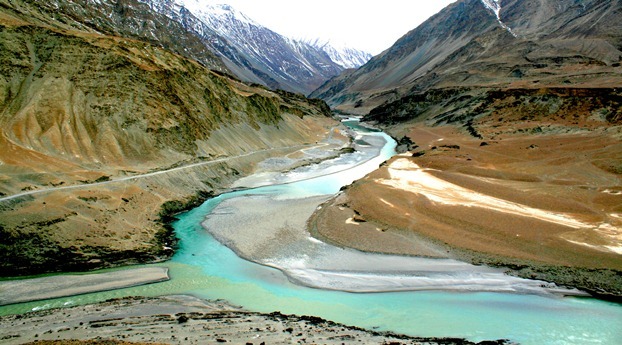 The Indus Valley is strewn with small villages and medieval monasteries that make it very interesting trip. A short trip to the gorgeous north India, this tour takes you to the famous tourist attractive destinations which have been attracted tourists across the globe for its everlasting imposing landscapes and stunning snow clad huge mountains. After breakfast at the hotel, drive with packed Lunch to visit Stok Royal Palace. After then drive to Hemis to visit the biggest and richest monastery. On way back visit Thiksey monastery and Shey Palace. Overnight at hotel. Morning after breakfast at Resort, drives to Lamayurugompa.Lamayuru one of the oldest and largest Monastery of Ladakh.Lamayuru is host to two annual masked dance festivals. En route awesome and spectacular view of Indus valley, high snow clad peaks of Greater Himalaya. Later drive back to Leh. Overnight at hotel in Leh. Early morning drive to Pangong Lake 149 km from Leh. Today you cross Chang-la (The world's third highest motorable road in the world 5300m). On the way, enjoy view of beautiful mountains, animals like Yaks and colonies marmots, nomads and Chanthang valley. Arrive at Lake, the Lake is 136 km long and 5-10km wide, 47% of this lake is in India and rest is in Tibet. The view of lake is spectacular and breathtaking. Spend few hours there while overwhelming, captivating the beauty of nature and later on drive back to Leh. Overnight at Hotel in Leh. Post breakfast, drive half day tour to Khardung-La top(18380ft). En route enjoy awesome and spectacular landscape of Indus valley with Leh town and surrounding huge towering mountains. Later return back to Leh. Post Lunch free to enjoy hike in Lehcolorful market. Overnight stay at hotel. Bed and Breakfast and one meal (Lunch or Dinner). Transport by Non-AC Innova/Xylo/ Scorpio. Point to Point Transfer and Sightseeing as per the Itinerary. Environmental Charges, 200 INR per person. Tips, hard & soft drinks, mineral water, laundry, postage, telephone calls. Anything not specified above and any item of personal nature. Any expenses caused by reason beyond our control. Such as road block, cancellations due to natural calamities etc. Any thing not specifically mentioned under the head "Cost includes". Child below 5 years sharing same bed. No Charge..
Child Above 10 years will be considered as adult.